I seem to be learning Spanish. I got sucked into it via an iThing app called DuoLingo, which I found pretty addictive. DuoLingo is also a web site and you can also learn other languages there. They currently only have languages that use the Roman alphabet. I'm not sure if it is the best way for me to learn a language, because it does not teach about grammar at all; it just tests you on phrases and sentences in various ways. Which does work for me to some extent, but eventually I began to seek out other sources. Anyway, I went through the whole mini-course on the iThing app and now I want to branch out. Have you learned or practiced or brushed up on Spanish using any particular web sites or apps that you recommend? I'm willing to spend money. I don't actually want to interact with anybody, though, so I am not up for taking in-person classes or doing chats over the Internet or anything like that. Defined as “a course of study made available over the Internet without charge to a very large number of people”. A few days ago it added "twerk." language matters: "disablism" vs "ableism"
This is about how the word "disablism" makes more sense to describe "oppression against people who are labeled as disabled and/or the idea that disabled people are not as good as to non-disabled people." The main way it speaks to me is in the bit about the continuity of life as ability changes. I still go back and forth about whether to call myself disabled because I didn't have a sudden change in what I am capable of; I feel like the same person except in certain "metrics" (how far I can walk, how much of certain meds I need to take, etc.). ableism implies that this oppression is somehow related to ability – which it is not. Disability is a social category and its label is imposed on certain groups of people because of their perceived characteristics as un(der)productive. using ableism makes it really easy for people to equate ableism with discrimination based on ability. Words like "paralysis" and "disabled" are often used in disablist ways to talk about full stops but this is far from the way disabled people live our lives. If someone becomes disabled, their life continues and their body, while different (and possibly even painful or frustrating) is what allows their life to continue. We all have able bodies. If we don't have able bodies we are dead. (very long) Bruce Schneier talks about the difference between feeling secure and actual security, with digressions through innumeracy and irrational decision-making tendencies. I'm not sure I believe all of his theories, but I believe some of them. (From July) Elaine Wherry, a founder of Meebo (now owned by Google), analyzes the behavior of high-tech recruiters, including that they try to poach people from the very companies who hire them to find new talent. Transcript of PBS show. The limitations of fingerprint, bite mark, and blood-spatter analysis (sorry Dexter); the potentials of virtual autopsies and 3D recreations of crime scenes. Artist Pei-Ying Lin, Master of Art in Design Interactions, is doing a project called "Unspeakableness." 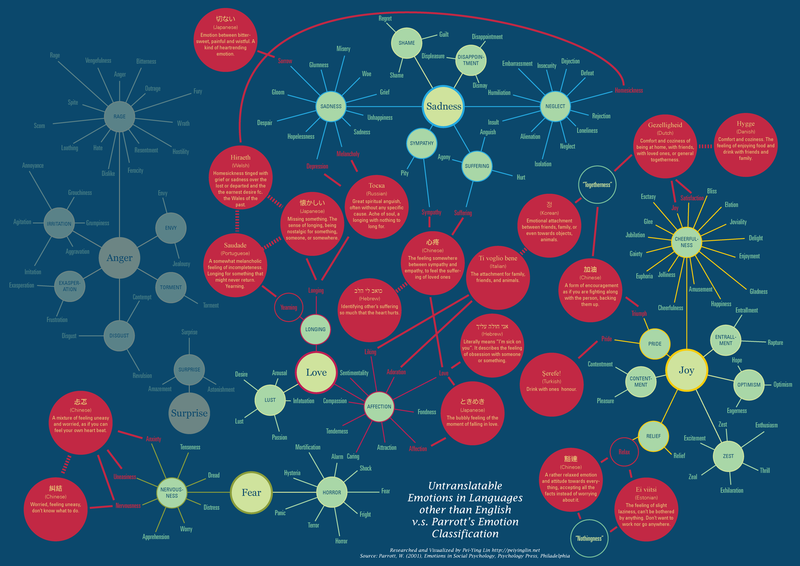 Part of the project is this infographic that takes an emotion classification map designed by W. Gerrod Parrott and overlays "untranslatable emotions in languages other than English." I looked at the overlay and found several words that were supposedly untranslateable but I know words in English that seem to mean the same thing. For example, there's a Chinese word that is supposed to mean "A rather relaxed emotion and attitude towards everything, accept all the facts instead of worrying about it." I think a word for that in English is "equanimity." (This is a word commonly used in Buddhist studies, and it is an emotion, although some people probably don't think of it that way.) "Equanimity" doesn't appear on Parrott's map. "(Hebrew) Literally means 'I'm sick on you.' It describes the feeling of obsession with someone or something." Crush? (Not on Parrott's chart) Obsession? (Not on the chart.) Infatuation? (On the chart...although it's connected to "lust" and not to "longing," which I disagree with. "(Chinese) The feeling somewhere between sympathy and empathy, to feel the suffering of loved ones." I would call this "compassion." But Parrott has "compassion" connected to "affection" with no connection at all to "sadness" or "sympathy." "(Japanese) The bubbly feeling of the moment of falling in love." The poly community calls something like this "new relationship energy," although that means more the first several months of falling in love, not the first instant. I'm not sure why it's different from "infatuation." Within is a table containing four translations of the poem "Pod jednq gwiazdkq" by Wisława Szymborska. This entry was originally posted at http://firecat.dreamwidth.org/791082.html, where there are comments. This is from a comment I made in xiphias's journal, where there is a discussion of the concepts "theist," "atheist," and "agnostic." I'm very much of two minds. Intellectually I'm scientifically oriented and don't believe in things I don't have evidence for. Emotionally, on a subconscious level, I often have a feeling that the universe is benign ("of a kindly disposition"), although I don't really imbue it with personality so I wouldn't call it belief in deity. I've tried various ways of balancing these things. My current solution to this two-mindedness is a Buddhist practice with no belief in deity and with a goal of bringing me into better contact with whatever benignity does exist (in me and other beings). "Supermanket" and an excess of "quotation marks"
Bonus Pack: Vegetarian) and women sign up as "clients" to "browse" and "buy" the "products." The idea is pitched as giving women more control over dating. I have heard that on most het dating sites, women rarely contact men, so I guess this is also an attempt to overcome that tendency. I think the buy/sell metaphor is really offensive. But the first thing I thought when I heard about the site was "Whee, now there's another online store where I can put things in my cart and not buy them." A lot of the comments on the article say "OMG, can you imagine what people would say if there were a Superwomanket?" I guess the people saying that have never typed "escorts" into a search engine. @firecatstef: I don't want to listen to a "conquering jealousy" podcast. I want to listen to a "conquering the overuse of martial metaphors" podcast. What do we mean when we talk about class? Is it about how much money we have? How much education? How we grew up? Our position with respect to a global capitalist world system? There have been a lot of WisCon panels in the past focused on speculative fiction that "does class well"—but how can we know whether something's being done well if we don't even know what it is? This panel brings together WisCongoers with expertise and experience in talking about class to hammer out (if not actually decide upon) some definitions. I am noodling about some conversation around a current event, but not directly addressing the event or the people who are involved in it. There is some fascinating discussion in the comments of this post. I try really hard not to only pay attention that are “reasonable”. I think it very important to read about unreasonable, insane, and otherwise brain-dead people from the simple point that I’m looking at them from my point of view. If I stuck with reasonable, then I’ll be just confirming the biases I already have (I believe the proper term is confirmatory bias or something like that). I won’t learn anything more and I’ll just put myself in a bigger hole that I’m already in....I think it critical to see the world from points of view that don’t agree with you, those unreasonable people out there. Two things strike me here. One, I agree that if you only pay attention to people you consider to be acting reasonable, you'll end up with confirmation bias. Two, when you see "reasonable" opposed to "unreasonable, insane, and otherwise brain-dead," and you see "unreasonable" defined as "points of view that don’t agree with you," it's easy to see why conversations go astray. It's easy to end up with "Be reasonable" meaning "Agree with me" and "You're not being reasonable" meaning "You're not agreeing with me and therefore you're insane or brain-dead." http://www.jimchines.com/2010/09/reason-anger/#comment-15990 Laura Resnick: It’s also worth noting that -emotion- is highly over-valued by many people, i.e. the notion that how strongly you feel about something has a direct corollary to how informed, valid, or inherently correct your opinions are. I don't like the word "over-valued" there. What she's really talking about is public behavior, not emotion, and what she's really saying is "People who publicly express emotions are taken more seriously than people who don't." And personally, as a cold fish, I don't like that. But I don't know that this translates to publicly expressing emotions being "over-valued." http://www.jimchines.com/2010/09/reason-anger/#comment-16307 Skennedy: Any motivations ascribed to thousands of individual comments and tens of thousands of opinions spread on peoples’ own blogs are straw men - easy to dismiss compared to the rainbow of actual diverse opinion. I now have almost automatic reactions to phrases such as "those people": "which people do you mean, exactly? what makes you lump them together?") and I am glad of these reactions. But I probably retain more tribal-creature thinking than I am aware of. graymalkin sent me an article about introversion. I think the article is OK and I think that articles debunking myths about introversion are generally a good idea. But there are some ways that this article ends up reinforcing some myths about introversion, and it has some other problems. Here is my understanding of introversion: Being drained by spending time in social environments (as opposed to gaining energy thereby). Needing alone-time to recharge. Here are things commonly associated with introversion that I think are not inherently part of introversion: Shyness. Social phobia. Social awkwardness. Invariably being quiet in groups. Being unable to think on your feet. Disliking to perform. I learned a long time ago not to call carbonated drinks "pop." But otherwise spot-on. (Scene: A deli in Connecticut. Me: [orders sandwich] "...oh, and a pop." If this intrigues you, go read more and comment. I like the idea of objecting to de-humanizing behavior rather than to the label some people who engage in such behavior use. E.g., I prefer "Down with people who use Christianity as an excuse to restrict other people's rights" rather than "Down with Christians," and so on.